In 2001, an entrepreneurial dive operator named Captain James Abernathy was busy developing his master plan. As an avid shark diving enthusiast, Jim was furiously chumming all over the Bahamas to find the sharkiest locations for his guests. Dry Bank as it was known then, lay a few hours north of Freeport. It had a reputation for big shark action among shark fishermen so one weekend Jim decided to give it a try. In less than an hour of intensive chumming, five tiger sharks showed up including a gargantuan sixteen footer. Lemon sharks were even more plentiful. Jim immediately knew he’d found his gold mine. He coined the name ‘Tiger Beach’ and the rest, as they say, is history. Word of the spectacular new hotspot swept through the scuba diving community. 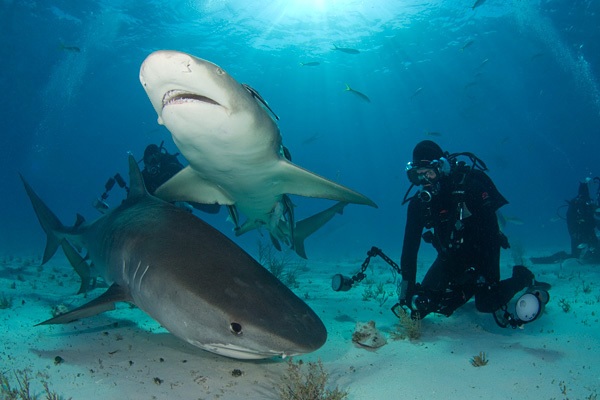 Within no time, divers were flocking to the site where tiger sharks were virtually guaranteed. Apparently, word also spread among the sharks themselves because upwards of a dozen tiger sharks sometimes came to investigate and the initial small gathering of lemon sharks eventually swelled into a legion of lemons thirty or forty strong. Random visits from bull sharks and nurse sharks added to the wild west feel and cameo appearances by enormous great hammerhead sharks were the icing on an already top heavy cake. Today, Jim Abernathy’s Shearwater and Scott Smith’s Dolphin Dream are two liveaboards that regularly ply the waters around Tiger Beach. Both companies offer excellent service. A typical day on the Dolphin Dream starts with a very big breakfast because unlike most destinations, at Tiger Beach there is no reason to dry off until the sun drops below the horizon. 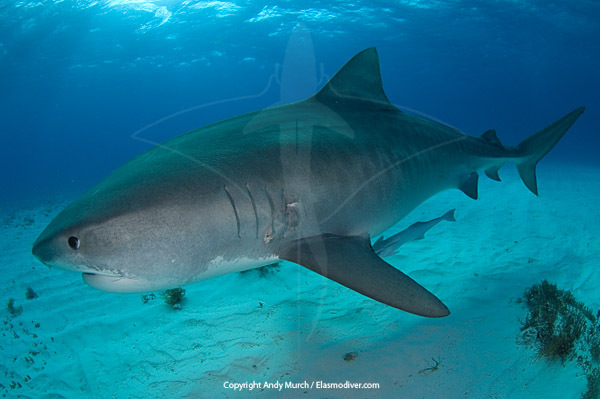 As long as there is chum in the water, the lemon sharks hang around 24/7. Once the dive ladders are lowered, the diehards slide in for their morning shark fix. After elbowing their way through a swirling mass of sharks to the sugary white sand, most people dig in close to the bait boxes where tigers are more likely to make close passes. Some divers head off alone for a while to photograph lemons on the fringing reefs but the lure of the shark circus always brings them back. The diving is so shallow and relaxed that even air-hogs can generally squeeze an hour out of each tank. As long as they remain close to the ship there is little danger in letting their SPGs drift closer to zero than would normally be advisable. Some Zen-like divers disappear for hours, lost in observation of the endless parade of lemons. There is no dive schedule at Tiger Beach. Once back on the swim step, divers need only wait a few minutes for their tanks to be replenished before diving back into the fray. Many first timers never make it past the ‘wow factor’ of being able to swim around with so many large predators. They spend their entire trip in a tiger shark induced trance. Multi-trip veterans start noticing more interesting behaviors as the sharks go about their daily routines. 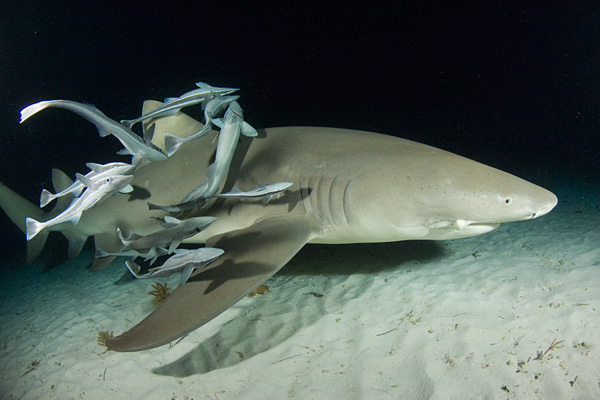 At the periphery of the action one or two lemon sharks can usually be found lying motionless on the sand. They rest with their mouths wide open so that freeloading remoras can finally earn their keep by performing dental hygiene and removing irritating parasites from their skin. To the uneducated eye, the sharks may look like they’re swimming around randomly but there is always a subtle hierarchy of size. Close attention will reveal smaller sharks giving way to their larger brethren whenever they get too close. Also, lemons sometimes band together in a show of hostile solidarity. If they see another species of shark entering their territory, the closest members of the pack will charge the newcomer in unison. This generally has the desired effect to the dismay of divers that want to encounter as many species as possible. When the lemons are thick on the ground they even intimidate the tiger sharks. Tigers are surprisingly shy and patient; willing to skirt the perimeter until a direct path to the bait is finally open. Occasionally, a behemoth tiger in the 14ft+ range will show up. The biggest tigers are fearless, having earned their stripes during many years of hunting, mating and brawling. Alpha-female tigers swim wherever they want, scattering the lemons like children chasing pigeons. When a shark of that magnitude enters the arena there is no stopping them. Their jaws which are strong enough to slice through turtle shell, can shatter the sturdy plastic milk crates that operators use to hold the bait. Fortunately, very few of the participating sharks at Tiger Beach show any aggression towards divers. Occasional nips from lemon sharks have occurred but the sharks can’t really be blamed if a photographer is frantically shaking a dead fish in order to get point blank shots of a feeding shark. That’s just Darwinism at work. 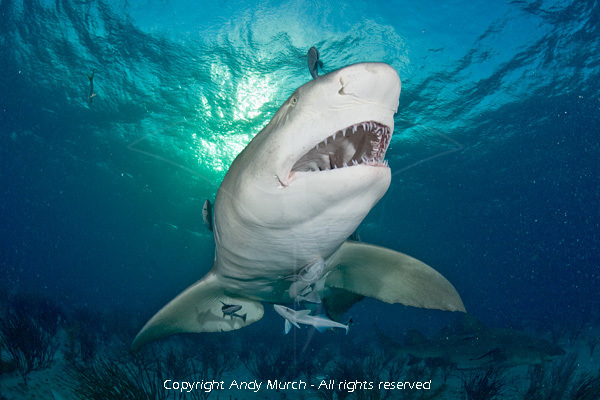 As impressive as tiger sharks are, it is the lemons that offer the best photography opportunities. Lemons are posers, the shark equivalents of catwalk models. They are bold enough to approach photographers very closely but selective enough eaters to focus solely on the bait while ignoring the annoying monkeys that keep getting in their way. Because of their attractive golden cast, lemons stand out extremely well against the perpetually turquoise backdrop of tiger beach and their daunting size (usually up to about 2.5 meters) and rake-like dentition present a powerful image to the camera. 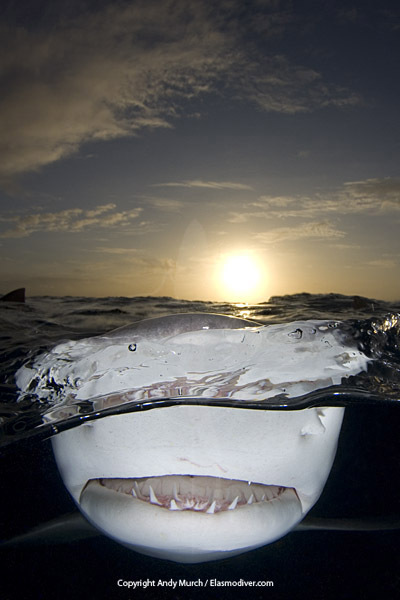 Portraits of lemon sharks overwhelmingly scream ‘this is a shark to be reckoned with’. The last dripping shark junkies collapse onto the deck just in time to watch the sun turn red. Ignoring the delicious aromas wafting from the salon, they dry their pruned hands and wrestle topside cameras from their dry bags. When the sun sets at Tiger Beach the show is far from over. Wranglers string baitfish onto monofilament lines and get to work. By dangling tasty snacks in front of the sharks they are able to lead them right to the guests that are crowding precariously onto the swim step. SLRs chatter on rapid-fire mode as the sharks sweep by, heads above the water, chasing the baits. Sneaky lemons obscured by the dying rays of the sun lunge from unexpected angles inhaling the scraps and sending spray in all directions. Some photographers bravely dangle their submersible rigs off the step to capture the moment from above and below. It is a difficult technique to master but extremely satisfying when all the elements come together: water, air, fire, sharks and that intangible fifth element that separates a snapshot from a magical moment - timing. As the sky fades to black, the guests rush inside for their own comical feeding frenzy. Battery chargers hum and computers whine indicating the progress of downloading memory cards. Once the food has been devoured, urgency seeps back into the salon. Tiger Beach is preparing for its second curtain call of the day. On the swim platform of the Dolphin Dream, floodlights drill into the sea transforming the inky water into soft blue shadows. Half of the exhausted guests remain prostrate in front of the TV but the diehards are ready for one more hoorah. After struggling back into their cold, wet neoprene they sink to the seabed and wait for the crew to empty the day’s bait crates in preparation for tomorrow. Soured carcasses rain down to the sand, igniting the lemon sharks into a mushroom cloud of mayhem. The firefight begins. Pencil thin beams from modeling lights flick back and forth in all directions. Strobes momentarily light up the night exposing the positions of passing sharks and hunkered divers, then plunge them back into darkness. 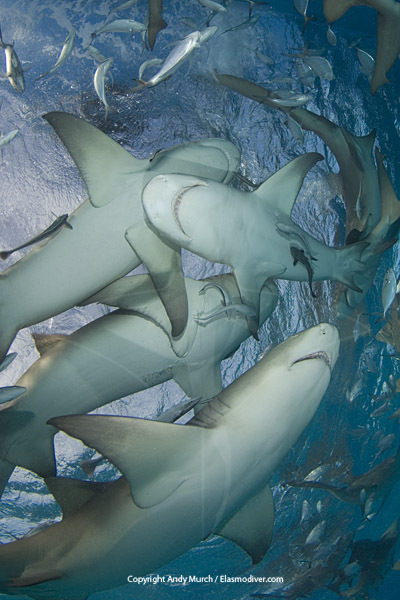 It is a chaotic scene but the lemon sharks, which are blessed with catlike night vision, somehow manage to avoid collisions. The ceasefire comes as soon as the scraps are gone. The lemons dissipate in search of a real meal and the humans regroup at the swim ladder. Laughter and nervous cussing pervade the night. The participants strip down one last time and stagger away to their bunks. That is Tiger Beach in all its glory. It is not for everyone but for those that enjoy the wilder side of scuba diving, Tiger Beach sets the bar. 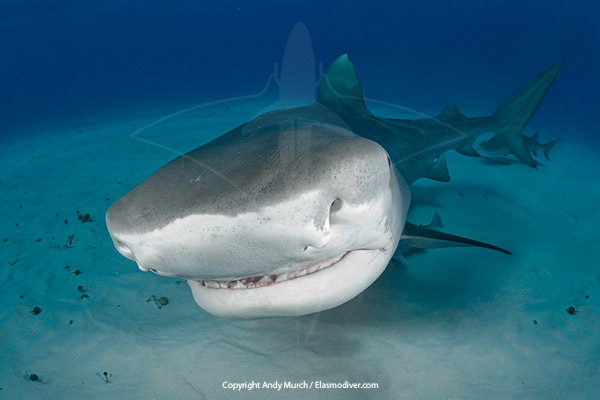 Andy Murch is a Photojournalist and outspoken conservationist specializing in images of sharks and rays.